First let me start with stating that spoilers will follow in this review as this movie cannot be properly analyzed without at least discussing these spoiler filled plot points. If this is an inconvenience and you wish to see the movie unspoiled then please see it first before reading this review. That being said this was a great continuation of the new Star Trek series brought to us by director J.J. Abrams. 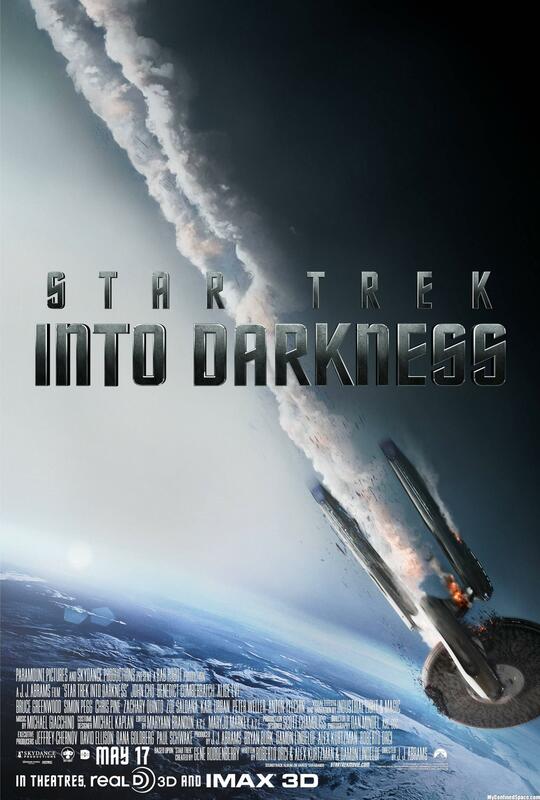 The movie opens with Captain James T. Kirk (Chris Pine) in command of the USS Enterprise and not following the "Prime Directive" rules set by Starfleet when he chooses to save his friend and colleague Spock (Zachary Quinto) from certain death. This sets up the necessary distance that Kirk and crew need to have from Starfleet as they embark on a mission of vengeance of both a commanded and personal nature. The mission is to kill John Harrison (Benedict Cumberbatch) after he has bombed a secret Starfleet facility and assassinated much of the high ranking officers at Starfleet headquarters. More on the story will follow in a bit. First let's talk about the writing and performances in general. Overall it was very well written and acted. Chris Pine is great in the role of Kirk, continuing to develop what he started in the first movie. As well Zachary Quinto is great as Spock, and continues to play the half-Vulcan, half-human, first officer of Enterprise with great poise and humility. However, it is Benedict Cumberbatch who steals the show as the main antagonist Khan. Did I just spoil that plot point? Yes, John Harrison is in fact really Khan who was woken from his cryo slumber by Admiral Marcus (Peter Weller). Weller is the secondary antagonist, and he's good and sufficient in his role as a war mongering Starfleet admiral. Again, Benedict Cumberbatch cannot be matched as he steals the thunder in every scene he performs in. Other notable performances belong to Simon Pegg as Scotty, who delivers a large amount of humor while also fulfilling his duty. Zoe Saldana is wonderful again as Uhura and she plays the hurt lover by Spock's earlier choice to die for the greater good before being saved by Kirk. She handles those emotions perfectly. However, it is Alice Eve as Carol Marcus who gets the better emotional performance when she pleas with her father not to destroy the enterprise. I will comment more on this in the story section along with the cinematography section. With cinematography the 3D conversion must also be discussed. The movie was brilliantly shot as a 2D movie, but it didn't quite lend itself to helping the 3D conversion with the lens flares. The lens flares were toned down in this one, but not enough in some instances. One that was absolutely terrible was a distracting lens flare that interfered with the touching dramatic performance as Alice Eve pleaded with her father from the Enterprise. Why? That was a really poor choice because it hurt the performance and was a distraction. It didn't add anything to the moment and was fully capable of destroying the suspension of disbelief. In fact with the 3D conversion the lens flares completely ruined that suspension of disbelief that 3D can help. Yes, humans do see lens flares in real life, but not to the same degree as a camera lens. In fact the lens flares too often draw attention to the fact that there is a camera in the scene. Not to mention the anamorphic lenses used on the cameras created a warp to some images that made the 3D conversion odd. Not to mention a few times because of the 2D cinematography there were screen violations because foreground objects in negative parallax were too far to the side of the image frame and caused slight discomfort. This was unforgivably detrimental to making this movie worth the 3D conversion. However, there were plenty of moments where the stereo was good. The visual effects were top notch as always. They played really well in 3D because all the elements that are built in 3D programs can be rendered out in stereo. However, that doesn't mean that some were ruined by lens flares. Why lens flares in space? I commented about this for the last Star Trek because by having a lens flare in space you acknowledge that there is a camera in space filming this event, and as a result make the filmmaker's presence part of the audiences awareness. Now for the story, which was very well done. It was a good continuation. A lot worked well for it, but at the same time there were questions. For example, why demote Kirk only to have him quickly reinstated to his same position in less time than the demotion can sink in and have an effect? That plot ploy was a bit weak. However, it did help in giving Kirk the distance he needed from the rest of Starfleet's high ranking officers. Next, was Scotty's resignation, which worked wonderfully. It was believable and worked well to serve as a means to get Scotty to be able to go off and do his own exploration and be in the right place at the right time to save Kirk and crew's lives. Now, as soon as Kirk starts beating Khan (still John Harrison to the audience at this point) and doesn't make a dent it brings to light that Harrison can't be human. The fact that he looks human and thus must be some superhuman instantly makes anyone with knowledge of the series and previous films know he has to be Khan. When he's revealed to be Khan I couldn't help but cheer, but get annoyed at the ploy to hide his identity. Then Spock contacting future Spock (Leonard Nimoy) to inquire about Khan completely changes the dynamics again. It shifts the arch nemesis status of Khan away from Kirk and moves it over to Spock. Even giving Spock the famous "Khhhaaan!" scream. However, it worked. Especially the role reversal where Kirk is put in the Spock position and sacrifices his life for the crew. Bringing him back to life using Khan's blood was in fact something that worked well to keep him part of the series, but rendered his sacrifice less effective. It even gives a new dilemma: how can anyone die for the rest of this series when all they need is a blood transfusion from Khan? No matter what issues rise from these new developments in the story, the movie is still a fun ride with well written action sequences and dialogue. The film is filled with great performances. And despite some drawbacks the cinematography is very well done. The 3D conversion however was wasted. Not only because of the way it was shot but also the way it was edited. Honestly in the future I will primarily see this movie in 2D even if there were some nice conversion work done by StereoD. I give this movie 4.5 stars out of 5, and most of the points against it have to do with those lens flares and as well doesn't counter in the 3D. Grading the 3D conversion and the use of 3D I give it 2 out of 5. If you haven't seen the movie I suggest you do. See it in 3D or 2D, it's up to you, but no matter what format you see it in you will enjoy it.